"Oh, the humanity! The turkeys are hitting the ground like sacks of wet cement!" 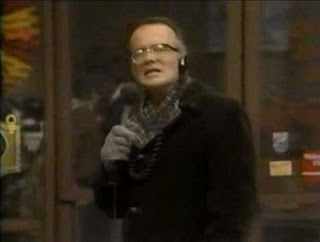 If you haven't seen WKRP's classic 1978 Thanksgiving episode, where a publicity stunt goes remarkably, hilariously wrong, you've got to check it out. The whole episode, where Mr. Carlson arranges to drop turkeys from a helicopter, and Les Nessman gives the horrific play-by-play, is here. Of course, nothing beats the best line in the episode, and possibly of the entire series: "As God as my witness, I thought turkeys could fly."